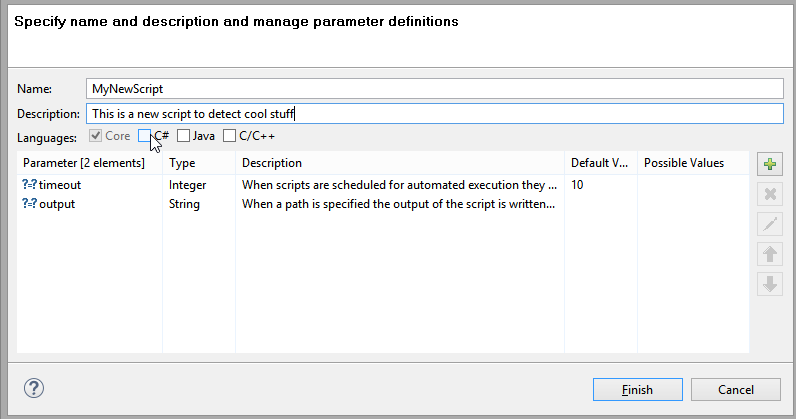 A new Groovy script can be created by "New" → "Other" → "Script" , or by selecting a Groovy script directory in the Files view (See Section 7.6, “ Managing the System Files ” ) and choosing "New Script..." in the context menu. The "New Script Wizard" will open. the output filepath where the textual output produced by println-Statements within the script is written. a list of APIs the Groovy script can use: "Core" contains functionality available to all languages, selecting any of the other languages offers additional functionality. Obviously, relying on a language specific API makes the script language-dependent.